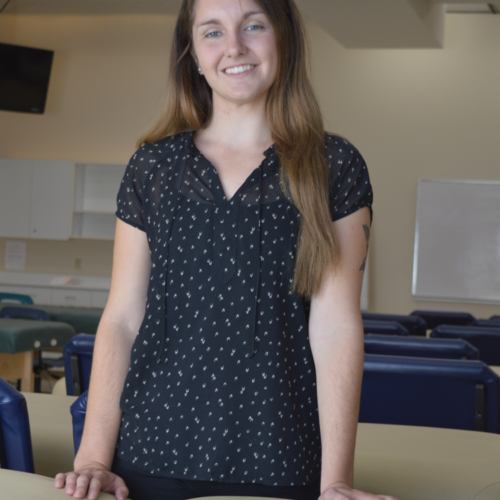 Danielle St. Laurent graduated in April 2017 and is currently in the process of writing her Board Exams. Danielle has already had handful of job offers and has secured a post with a clinic who was specifically seeking WCCMT graduates to hire. What made you decide to become an RMT? I always knew I wanted to go into the healthcare field. Both my parents were paramedics which I’ve always admired, but knew that I didn’t have the stomach for. My Mom mentioned that I should consider becoming an RMT just after I graduated high school and from then on it was always in the back of my mind. It wasn’t until three years later when I heard a commercial for WCCMT on the radio that I knew that it was what I had to pursue! What made WCCMT stand out to you when deciding which school to go to? WCCMT has been around the longest and when I was doing my research and asked around it was very highly recommended. It was an easy decision! Even before I took a tour of the College I was sold! What made you pick WCCMT in the end? After meeting with Admissions and taking a tour of the school, I loved the atmosphere of the College and how everyone interacted with one another. I liked how the clinic was a part of the College and how small the class sizes are. It was really important to look at the end goal too, so finding out that WCCMT consistently has the highest board exam scores was very important to me. How would you describe the atmosphere at WCCMT? It has such a comfortable and home-y atmosphere which was nice as it eventually became my second home! Everyone knows everyone at the school no matter what term and everyone is really close and supportive of one another. What resources did you find most helpful in order to succeed in our program? The bio-prep course, that is available before the program starts, was a great resource. As someone who hadn’t taken biology since high school, three years prior, it was nice to get a refresher before starting the program. I also attended many grad tutorials offered by recent graduate of the program which were extremely useful. The instructors gave so many after school tutorials for us and in clinic. There was always extra help available! If ever we were confused about something it was easy to find help. What do you think of the instructors at WCCMT? They always put in so much extra time and effort. They are always around when you need them and always take the time to answer your questions. Even when it’s coffee or lunch break, and staying later after class, you could tell they were more than happy to stay and answer questions or give extra demos. It’s obvious that the instructors love what they are doing and are the best in their respective fields. What was your favourite part of the clinic internship and why? Outreaches were one of my favourite things about WCCMT. There is such a variety of them and in the last three terms we got to experience so much. The ones I went to were Friends for Life, UBC Sports, BC Women’s Hospital and GF Strong Centre. The instructors there made the experience great too. I can tell that they loved being there and teaching us as much as they possibly could. There were Inreaches as well like Pre-natal and the Multiple Sclerosis Inreach (these are just the ones I attended) and those were awesome as well. It was so cool each term to work with a different group of patients and different conditions each time and learn about how we could help people in so many ways. Is there a specific clinic experience that stands out? I had one patient at the Friends for Life outreach that really made a difference in my life. This particular person was so kind and soft spoken. They made small talk with me throughout the treatments and ultimately wanted to relax and I think they needed someone to talk to. I could tell they were just a genuinely nice person who would do anything for someone. They were terminally ill and every time I treated them they made me feel like I had made a difference in their life. At the end of the five weeks, they thanked me so much for my help and we went on with our lives. It made me realize that no matter what happens in life, there’s always a positive side. This new attitude has helped me overcome a lot of obstacles and each time I come upon one, I remember that patient and their positive take on life. Of course, things are going to be overwhelming but it’s worth it to remember the good things as well! Did you feel prepared for the Board Exams? Definitely! The Mock Board exams and the Board exam prep courses were such a big help in getting ready for the exam. It’s great that the school does so much to make sure we are ready! What resources helped you feel more prepared? The two mock board exams we took in Term 5 were so helpful. It was nice to have an idea of what the exam was going to be like. In clinic we had a couple tutorials that helped prep us as well. After grad, the board exam review classes led by our instructors were very helpful to keep us on track! How soon after the Board exams did you find work? I actually got a job before writing my board exams. I was scouted by a clinic because of a referral from the school. Did you have a lot of employment options and did you feel as a WCCMT graduate employers were more interested in hiring you? Definitely. The owner of the clinic I was hired at had contacted WCCMT directly and asked the administration to refer a student to them, so they were looking specifically for graduates of our school! What was it like going to school in New Westminster? Well, other than school, I spent all my time at the Starbucks next door with the rest of my classmates! Of course there was all the food options at the New West Skytrain station and along Columbia Street. The Columbia Street Sandwich Company across the street is where I ate breakfast at least once a week! The city recently developed The Pier Park down by the Fraser River so there is a great place only minutes away to go hang out and study in the warmer months. Would you recommend WCCMT to your friends? Why? Absolutely! It’s definitely the best college. It’s maintained a great reputation for almost 35 years and consistently has highest board exam scores out of all the schools. What advice would you have for someone who is thinking of becoming and RMT? Give it 110%. It’s a fantastic school and awesome career to get into. Give it your all because it will pay off! What questions should people ask when considering a school? Make sure you know what you want from school. For example I wanted the option of class sizes and a variety of outreaches in the clinical internship which WCCMT definitely offers. I also really liked that the clinic as well as all the resources you could need were right there in the school for us to use.